'Nuclear' this and 'nuclear' that were big attention getters after the dropping of the uranium and plutonium bombs that ended World War II in August of 1945. Science was at the cusp of its foray into understanding and manipulating atoms at the nuclear level - a realm that at the time was not directly observable. 'Shadows' of elementary particles were successfully imaged, but many theorized that it would never be possible to directly 'see' an electron, proton, or neutron. One cause of the inability to image such a small entity was a lack of a stable enough reference source that could resolve tiny features. Short wavelengths (i.e., high frequencies) are needed, and the current standard - piezoelectric crystals - could not be fabricated thin enough to function reliably (or at all) in the microwave spectrum. Fulfilling the old adage of "necessity if the mother of invention," scientists developed the first atomic clocks that exploited a very stable and repeatable frequency reference based on electron energy level transitions of the ammonia atom. Doing so allowed the earliest measurements of sub-microscopic physical features of materials. This story details some the history. Modern microwave techniques make it possible to determine the composition of gases, liquids, and solids by observing microwave absorption spectrum. Fig. 1. Commercial equipment that is used in microwave spectroscopy. The poor propagational characteristics of microwaves on frequencies exceeding about 20,000 megacycles (wavelengths shorter than 1.5 centimeters) have led to developments which make possible extraordinary resolution of the molecules of matter. 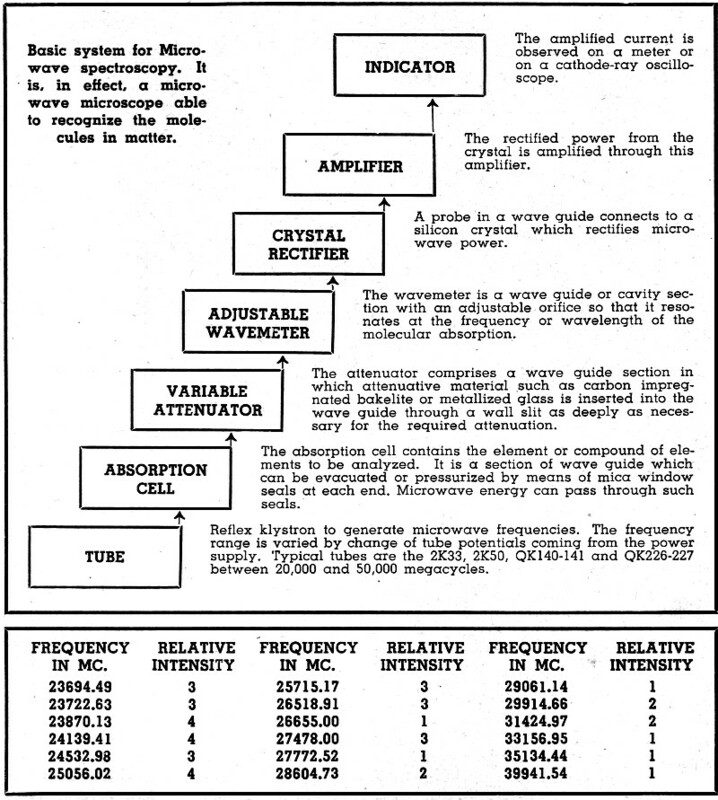 Microwave spectroscopy is the technique used to determine the radio frequencies in the microwave region (normally exceeding 20,000 megacycles) which cannot readily or even at all pass through gases, liquids, or solids. Such frequency is measured and is a direct indication as to the identification of the specific molecule of matter contained in such gas, liquid or solid. Every element of matter can disturb the passage of certain discrete frequencies or wavelengths. Microwave spectroscopy pertains to the spectroscopic art which falls in the microwave region commencing at a frequency of several thousand megacycles and continuing towards the spectrum of infrared. It is normally a negative indication based on critical frequencies which do not propagate through gaseous elements contained in a wave guide. The inability of specific frequencies to permit the passage of electromagnetic energy through individual elements or through compounds of elements provides a simple and reliable means of determining the presence, identity, magnitude, and relative concentration of molecular elements of matter. Radio frequencies below about 30 megacycles are capable of reflecting back to earth from ionized layers aloft. These are sky-wave frequencies. From about 30 megacycles to about 20,000 megacycles, there is a window in the atmosphere which permits direct-path communication without excessive attenuation. Fig. 2. 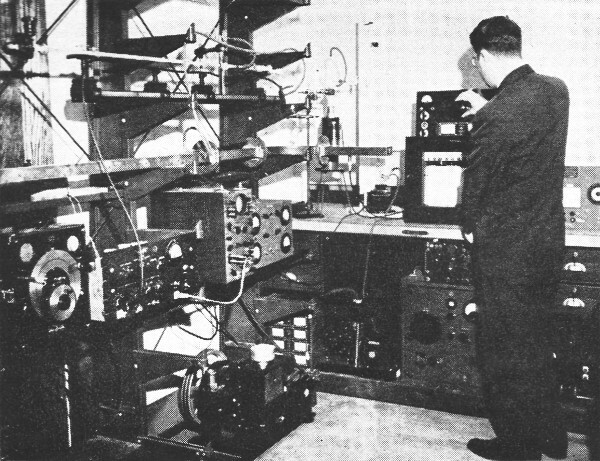 (Top) Microwave spectroscopy laboratory at the National Bureau of Standards. 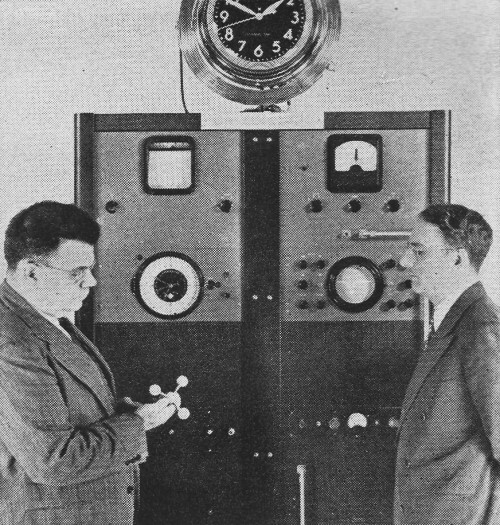 (Bottom) Atomic clock controlled by the spectral line of the ammonia molecule contained in wave guide cell coiled around the clock. Dr. E. U. Condon, Director of the Bureau of Standards is at the left and Dr. Harold Lyons. head of the Microwave Standards Section is shown at the right. Above 20,000 megacycles, there are encountered the "absorption frequencies." Lying between super-high frequencies and light are the so-called "black sheep" frequencies, involving absorption and scattering of radio waves by gases in the atmosphere. It has been found that water vapor (H20) produces molecular resonance at about 22,500 megacycles where propagational losses increase to over 0.4 db. per kilometer. Oxygen in the atmosphere is capable of providing maximum absorption or attenuation of microwave energy at a frequency of about 60,000 megacycles with attenuation being in the order of 10 decibels per kilometer. It gives fuel to the thought that every element or compound of elements, both known and unknown to science, have absorption frequencies. In the past, identification of atoms and molecules by spectroscopic analysis has been dependent on infrared, optical, and ultraviolet methods. This was largely limited to work on atoms and the simpler molecules. It has not been suitable for analyses of large, complicated molecules such as are encountered in the fields of medicine and industrial chemistry. The heavier molecules, rotating at slower rates, usually have spectral lines which correspond to the frequencies or wavelengths in the microwave region rather than in the infrared, optical, or ultraviolet parts of the spectrum. Infrared is associated with heat, optics with light, and ultraviolet with chemical rays. The larger molecules for which microwaves are considered very promising are the ones associated with plastics, polymers, rubber, textiles, foods, oil, drugs, and biological chemicals, such as vitamins. Where microwaves are employed, the apparatus may be called a "microwave spectrometer" having a resolution up to 100,000 times greater than an infrared spectroscope. This makes possible the identification of isotopes, such as are supplied to industry and medicine by the Atomic Energy Commission at Oak Ridge, because it can deal with the nucleus of the molecule. The other methods have been able to deal only with the outer parts of an atom or. molecule. As a result, microwaves make possible measurements with very small isotopic samples. To date, about 500 elements or compounds of elements have been analyzed by microwave spectroscopy resulting from absorption or scattering of electromagnetic waves between 20,000 and 50,000 megacycles. It is only the beginning of a vast amount of research involving extension of the spectrum, working with a greater range of pressure and temperature, and utilizing a greater selection of microwave power in more sizes and designs of waveguide plumbing. Fig. 3. Structure of ammonia molecule NH3. Fig. 4. 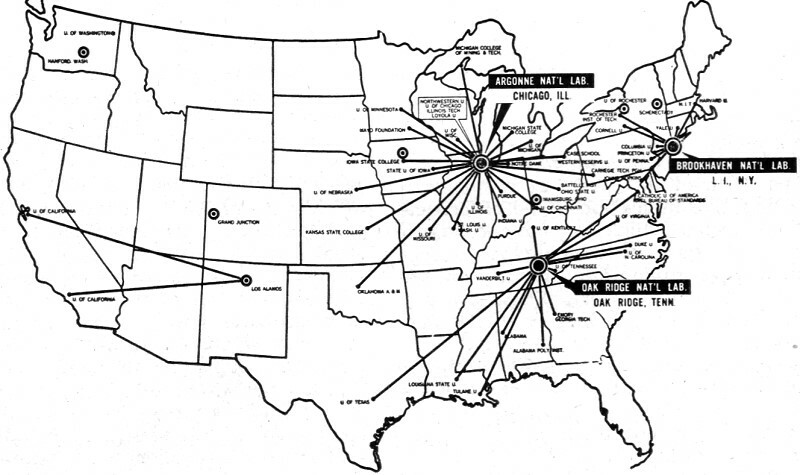 Locations of the Atomic Energy program in the United States, a large part of which are facilitating their work by the use of microwave absorption phenomena. The most interesting molecule likely to have earliest commercial application is that of ammonia. The constant frequency which can be derived from a microwave absorption line of ammonia gas provides an actual time constancy of one part in about ten million. Theoretically, a potential accuracy in the order of billions is indicated depending on the setup employed and the particular spectral line to be employed. It points the way to better utilization of the radio spectrum by reducing or eliminating the need for present, unduly wide, radio channels to take care of frequency drift. In the past, one of the problems on microwaves has been precise and narrow frequency control. Quartz crystal oscillators are impracticable, because crystals become too thin and fragile, besides requiring a large number of frequency multiplication stages. Microwave spectroscopy now makes possible frequency stabilization on the higher microwave frequencies with an order of virtual perfection. Atomic oscillators and spectrum lines may be used as filters to give the necessary frequency control and stability. A filter can consist of a cell (such as a section of wave guide seal at each end with mica windows transparent to microwave energy) filled with a gas that can absorb many different frequencies. Either bandpass or bandstop filters can be devised by the use of appropriate gas and microwave plumbing. Such filters can be electrically tuned by making use of the Stark effect. This is the name given where an applied electric field such as 100 kilocycles is applied to a metallic strip located in the center of a wave guide and insulated therefrom. It can force a molecule to change its frequency. Fig. 3 illustrates the ammonia molecule (NH3) comprising a nitrogen nucleus at the apex and three hydrogen nuclei at the base in the upper part of the figure. The ammonia molecule is in the form of a pyramid. Each nucleus is surrounded by its characteristic electron charge. The average distance between the nitrogen nucleus and each hydrogen nucleus is 1.01 angstroms (one angstrom is a hundred-millionth part of a centimeter, which in turn is 0.4 inch). The average distance between the hydrogen nuclei is 1.63 angstroms. The pyramid is about 0.38 angstroms high. The apex angle between hydrogen-nitrogen-hydrogen (H-N-H) nuclei is 107 degrees. When the ammonia molecule NH3 absorbs energy at one sharply defined microwave frequency, it can turn itself inside out as illustrated by the diagram shown at the bottom of Fig. 3. Fig. 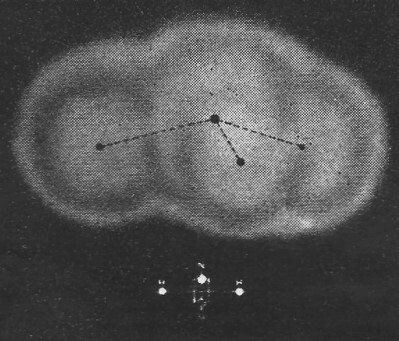 2 (bottom) illustrates the new atomic clock developed by the National Bureau of Standards, capable of keeping perfect time to within a second for a period of centuries by the use of ammonia molecule primary standard. The gas cell comprises about 30 feet of 1/2" x 1/2" rectangular wave guide tubing wrapped around the clock in Fig. 2. To the left of this figure, Dr. E. U. Condon, director of the Bureau of Standards, holds in his hand the model of the ammonia molecule. At the right is Dr. Harold Lyons, head of their Microwave Standards Section, whose group is responsible for this development. The scope portrays the spectral line of ammonia at a frequency of 23,780.1 megacycles. The strongest spectral line of ammonia is called 3,3 absorption line. It corresponds to the quantum transition in which two quantum numbers (called J and K) have the value of 3. The invariant frequency of ammonia, regardless of temperature, controls the timekeeping of the clock. Below 1 1/2 centimeters, the ammonia absorption lines (shown in Table 1) have been measured against the National Bureau of Standards Station WWV. The strongest (see Table 1) thus far has been 23,870.13 megacycles with a relative intensity of 4. Fig. 2 (top) shows the microwave spectrometer assembly at the National Bureau of Standards, as it is used to extend the precision and frequency coverage of presently available absorption lines used as frequency standards. The pertinent portion is the 1 centimeter wave guide (1/2" x 1/4" rectangular tubing) at left top utilizing a Raytheon RK33 tube. Absorption of a given frequency of an incoming microwave signal by gas such as an ammonia vapor is revealed on the oscilloscope or recorder as a relatively sudden intensity drop, representing a spectral line. 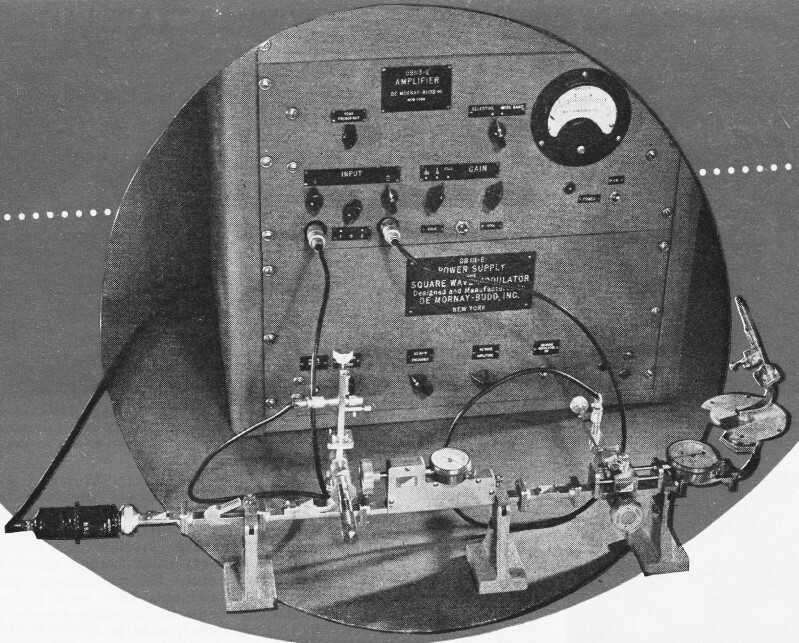 For sensitive detection of spectral lines, the Bureau also employs a Stark absorption cell (the larger wave guide 3" x 1 1/2" shown below the 1/2" x 1/4" wave guide system) in which an electric field is used to modulate a wave traversing the cell by electrically shifting the frequency of the spectral line back and forth. Extremities support the Stark ribbon inside the larger guide. Heavy or deuterated ammonia is used inside the wave guide absorption cells to extend the frequency coverage below that now available with other substances. Table 1. Relative intensity versus frequency of ammonia absorption lines as measured against National Bureau of Standards station WWV. 1. A source of microwave power. Normally this is a tube feeding directly into a wave guide. Work started with the Western Electric 2K50 reflex oscillator. When production of that tube ceased after the war and the supply became exhausted, Raytheon developed the reflex klystron types QK140 and QK141 for the region 8 to 11 millimeters. They have also developed the types QK226 and QK227 for the region 5.8 to 8 millimeters where the power output is in the order of 5 milliwatts. 2. A calibrated variable attenuator to control the energy from the tube into the gas cell. Fig. 5 (top) shows a modern type where attenuative material is inserted into the wave guide to provide the degree of attenuation desired. Each thousandth of an inch penetration as controlled by the knob represents one division on the indicator scale. The scale is calibrated against a graph furnished with the instrument. 3. 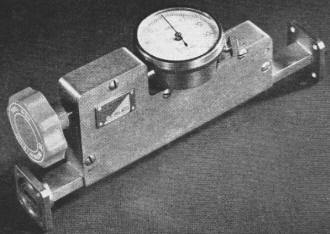 A wavemeter for measurement of the absorbing frequency such as shown in Fig. 5 (bottom). In the better versions, it is made of invar for the main cavity portion in order to minimize frequency error with temperature change. 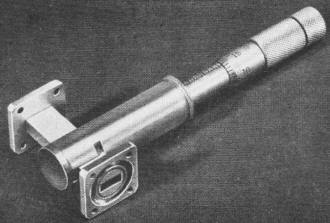 A silver plated plunger is mounted on the end of a micrometer barrel. The frequency is determined by the use of differential readings on the micrometer between two adjacent signal points. These are referred to calibration tables, one showing differential micrometer reading versus frequency in kilomegacycles, while the other gives the exact frequency in megacycles for each thousandth of an inch in micrometer reading. 4. 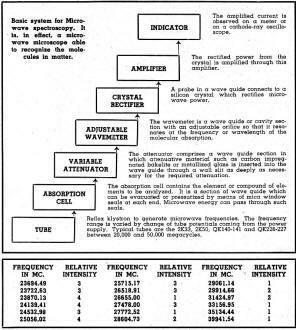 Various optional items and features including power supply, modulator, crystal assembly with its output feeding into an amplifier and indicating meter as illustrated in Fig. 1 for general microwave laboratory set-ups not particularly limited to spectroscopy alone. The usual procedure is to take a wave guide section and make it gas tight by using a thin transparent mica seal at its flanges where it joins the adjacent plumbing section. Suitable fitting is provided to connect to a glass piping system for evacuation, inserting pressure, insertion and removal of samples, etc. Fig. 5. (Top) Calibrated variable attenuator used for microwave spectroscopy. (Bottom) Micrometer type of wavemeter or frequency meter to measure frequencies employed in microwave spectroscopy. Fig. 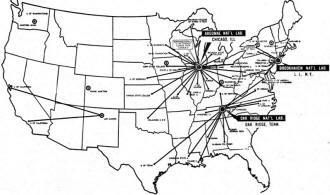 4 is a map of the United States showing the principal activities and locations of the Atomic Energy program, together with their associated universities. Microwave spectroscopy is taking place at such activities as the Gaseous Diffusion Plant at Oak Ridge, Tennessee (Fig. 6) and the Brookhaven National Laboratory at former Camp Upton on Long Island. At Brookhaven National Laboratory, Dr. Victor W. Cohen heads the Nuclear Moment Laboratory where work is going on with microwave spectroscopy to study nuclear spins within the molecule. Fig. 7 shows a spectral line with the base line protuberances (two at each end). These are typical of phenomena under study for nuclear spins or moments. One of these studies is with the element Sulphur 32 as compared to the radioactive element Sulphur 35. The difference of three in its nuclear makeup accounting for its radioactivity is under study by means of microwave spectroscopy. 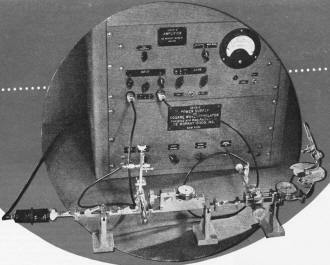 The art of microwave spectroscopy started out with a combination of home-made components except where they could be made up from commercial sources manufacturing 1 centimeter radar plumbing. One manufacturer was particularly fortunate in having a complete line of 1 centimeter components in regular production postwar as the result of having guessed wrongly as to the direction in which radar and communication frequencies would move. Microwave spectroscopy has been depending on such source for their commercial requirements. 1. A leading oil company is engaging in the analysis of hydrocarbons. Their plan is to determine interatomic distances, molecular structure, molecular flexing, and rotation. They feel some of this phenomena occurs in the microwave region at approximately 50,000 megacycles, which should be possible to determine by shooting microwave energy through gas samples in a wave guide. 2. Dr. W. D. Hershberger of the RCA Laboratories in Princeton, N. J., is attempting frequency stabilization with microwave spectral lines involving use of the absorption frequency of ammonia at 23,780.1 megacycles. 3. Dr. Townes and staff of the Columbia Radiation Laboratory in New York are doing outstanding work in studying the absorption of a large number of elements and compounds. They are developing one of the most complete lists of absorption frequencies to facilitate identification. 4. The Western Regional Research Laboratory of the U. S. Department of Agriculture have a number of plans of attack for their newly acquired microwave spectroscopy equipment. One of their dreams is to analyze the evaporated vapors from strawberries or similar fruits to connect the data with taste and flavor of such agricultural products. 5. Meteorological activities are lining up microwave spectroscopy techniques for lower and upper atmosphere research to determine the concentrations and compositions of the various gaseous elements in air at all levels. 6. Others are using microwave spectroscopy techniques to facilitate their research in the adjacent infrared region. 7. Some speak of the development of a push-button microwave microscope working with molecules of gas, liquids or solids. It is expected to perform many new functions that have been found impossible to do with the electron microscope, x-ray or spectrometers and spectrographs. Fig. 6. 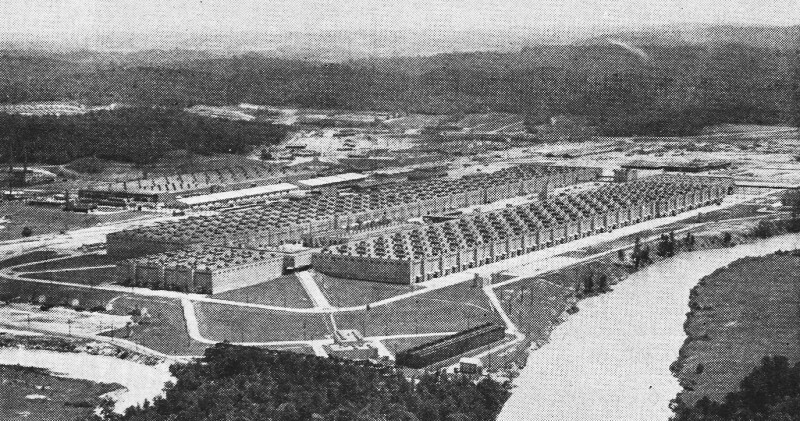 One of the mammoth plants of the Atomic Energy Commission at Oak Ridge, Tennessee, employing microwave spectroscopy to facilitate their work. Fig. 7. 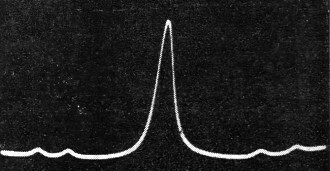 A typical spectral line with indications of nuclear moments due to the nature of the molecule. In addition to the sources of information mentioned in the text, the author wishes to thank Dr. Walter Gordy of Duke University, Professor Smyth of Princeton University, Professor Gwinn of the University of California at Berkeley, Marks Brook of the University of California at Los Angeles, Dr. D. K Coles of Westinghouse Research Laboratories in East Pittsburgh, Mr. Sharbaugh of the General Electric Laboratories in Schenectady and many others. They are all hard at work on this development and making invaluable contributions about which there will be a good deal more to report in the future. It is going to result in many new avenues of opportunity for the radio and electronic technician or engineer. He is becoming very helpful in hitherto little related fields such as food, petroleum, metallurgy, plastics, medicine, and almost every field involving substances made up of molecules of matter in gaseous, liquefied, or solid states. In the modern university today, microwaves have expanded from 10,000 megacycles and below for electrical engineering, to as high as 30,000 megacycles for physics and to 50,000 megacycles and beyond for the chemistry departments. The field of chemistry now becomes the most important field for microwave application in connection with molecular analysis. In universities such as Princeton and University of California at Berkeley, the most advanced microwave developments on the highest frequencies are now in the chemistry department not - withstanding the importance of their electrical engineering and physics departments. 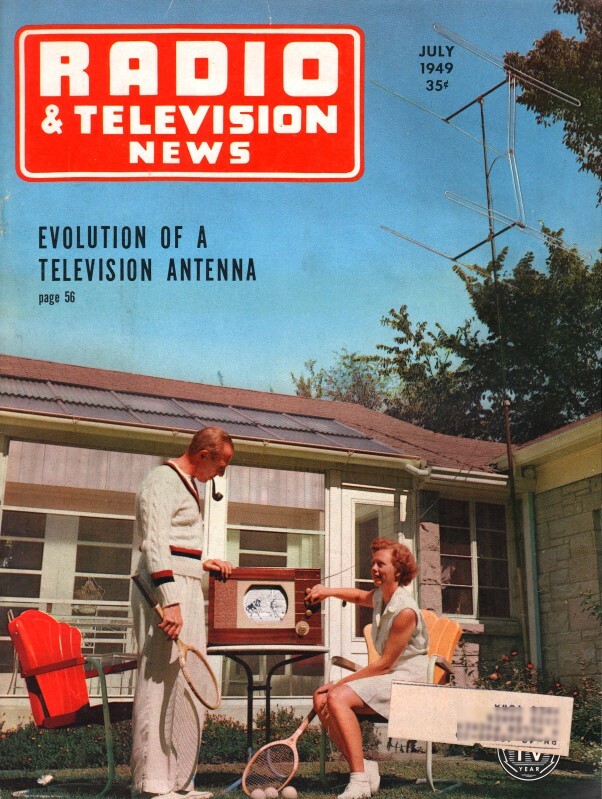 The techniques are sufficiently straightforward as to also be practicable for the radio amateur utilizing his highest assigned frequencies such as 21,000 to 22,000 megacycles or to lone experimenters, since the simplest microwave spectroscope or microscope is a tube and a piece of pipe. Anything more than that makes for precision and refinement.